Ron Terada’s practice is concerned with language, printed matter and the notion of authorship. Terada’s billboard intervention for PLAN LARGE incites and activates multiple narratives regarding the experience of urban space. He intends to thwart the normal operations and conventions of advertising by the sheer absence of a “sales-pitch” and by re-directing the viewer’s attention to the immediate surroundings. 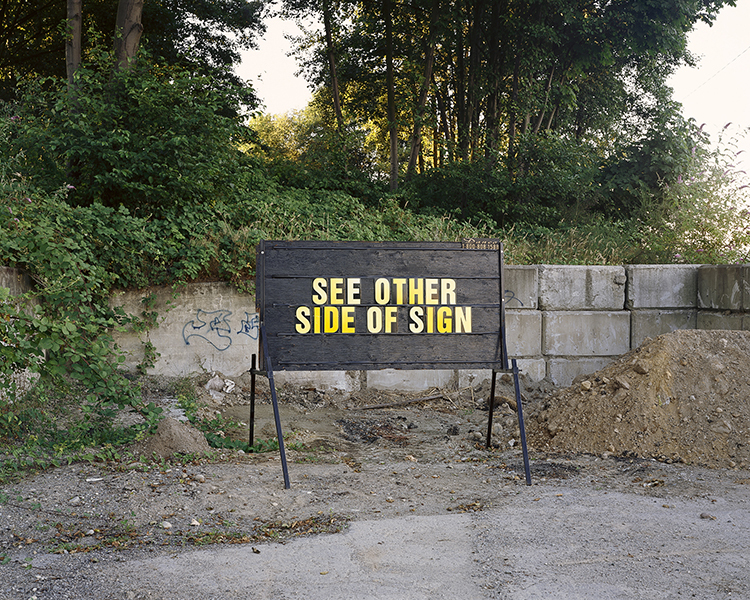 His work points to the ubiquity of signage in our daily environment and explores the absurdities of spatial perception. Ron Terada’s text-based photographs and public installations challenge and raise questions about the presumed normalcy of such pervasive markers of visual culture as advertising billboards and commercial neon or roadside signs. By playing with the “objectivity” and presumptive truth value that official signs engender, Terada exposes and undermines the influence of cultural institutions. Using adapted gallery signs, posters, brochures, exhibition, catalogues, and soundtracks, he inserts found text into surprising locations and contexts. The significance of this text is related to its dependence on preassigned meaning and sociopolitical context. By working in this way,Terada makes common cause with a whole generation of artists who are interested in self-reflexive inquiry that highlights and explores the absurdities of the everyday. Pieces such as Entering City of Vancouver (2002), Five Coloured Words in Neon (2003), and Stay Away From Lonely Places (2005) exemplify how Terada’s concepts are simultaneously vernacular, deadpan, intelligent, thought-provoking and, at times, comical. By mimicking banal visual forms, Terada asserts a contemporary viewpoint that casts suspicion on “high” art. In Stay Away From Lonely Places, for example, a neon sign bearing the same words as the title hangs on the front outside wall of a gallery. This ambiguous phrase, taken from a Willy Nelson song, competes with commercial advertising signs around it. Inside the gallery, a series of photographs document a variety of local signs that Terada has decided to highlight. The artist questions the social habits, economics and spatial dynamics involved in the various forms of public visual representation and corporate competition that punctuate our path through life. PANELS SITUATED ON THE USINE DE POMPAGE CRAIG WHICH IS UNDER THE JACQUES-CARTIER BRIDGE CLOSE TO THE VILLE-MARIE EXPRESSWAY.